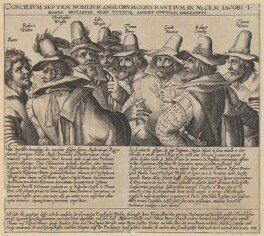 At about midnight on 4 November 1605 a search party sent by the King discovered Guy Fawkes, 'a very tall and desperate fellow', with thirty-six barrels of gunpowder, in a cellar under the chamber in which the opening of Parliament was to take place the following day. The discovery marked the end of two years of plotting by a group of disenchanted and alienated English Catholics, and of ten days of suspicion on the part of King James I and his ministers. The following day, 5 November 1605, the citizens of London were encouraged to light bonfires to celebrate the King and Parliament's narrow escape. An act was subsequently passed ordering annual public commemoration of the date, and Guy Fawkes Night, or Bonfire Night was born. It has been celebrated ever since. This display, in the fourth-hundredth-anniversary year of the plot, brings together the few contemporary prints that exist of the conspirators, portraits of those involved in uncovering the plot, and images depicting the plotters' executions. It also includes two satirical prints made about fifteen years later, in which scenes from the story were used in an attempt to stir up anti-Catholic feeling.